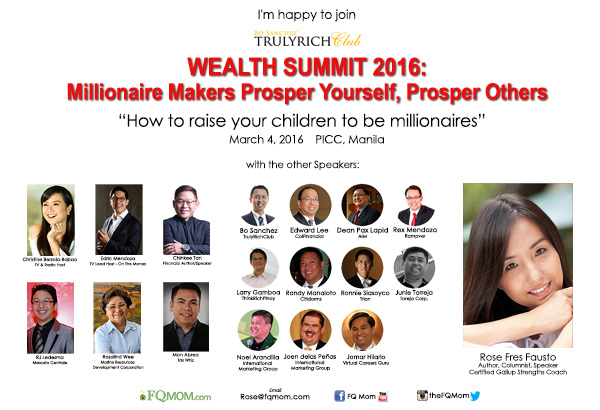 I’m inviting you to join the Wealth Summit 2016 (Millionaire Makers Prosper Yourself, Prosper Others) 9:00am – 5:00pm, March 4, 2016 (Friday) – March 5, 2016 (Saturday) and Post Summit Coaching Day, March 6 – 11:00am to 5:00pm at PICC, Pasay City. I’m happy to be part of this annual event of the Truly Rich Club. I will talk about how to help our children develop the economic self-defense which I call FQ! See you on March 4!